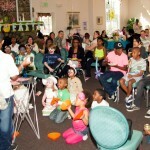 It was a beautiful, sunny weekend for Easter parties around western Washington! 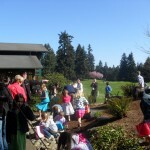 Saturday I performed for the Fircrest Golf Club’s Easter Brunch. As I drove up I noticed that the parking lot was already full, with golfers out enjoying the morning sunshine. 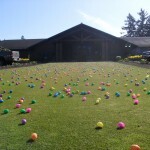 Nothing is more colorful than multi-colored Easter eggs sprinkled over manicured, bright green grass! When I arrived there were plates of doughnuts at each table. Another area featured “decorate a cookie” stations where kids were creating their own custom bookies. After that, it was outside for the Easter Egg Hunt. Each plastic egg had a mini chocolate bar or other individually-wrapped candy. Can you say SUGAR SPIKE? These eggs are just ASKING to be found! 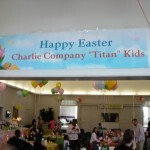 On Sunday I performed for Charlie Company’s kids’ Easter party at the Family Resource Center at Fort Lewis/JBLM. 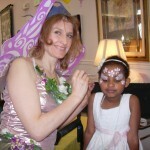 Joeetta and her friends did an incredible job of decorating and planning the party. 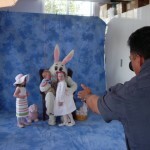 Along with magic, featured entertainment included face painting, a professional balloon artist, professional photographer By George Photography taking event photos as well as studio-style photos with Mr. Easter Bunny. 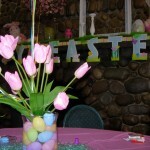 Of course, there was the Easter egg hunt as well as a huge catered meal and tables upon tables of cookies, Hostess goodies, cakes, pies, candies, and more. 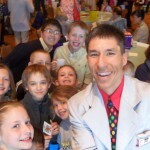 This entry was posted in Uncategorized and tagged Easter magic show, Easter magician, Famiy Resource Center, Fircrest Golf Club, Fort Lewis, JBLM, JBLM magic, magic, magic show, magician, Tacoma magician. Bookmark the permalink.